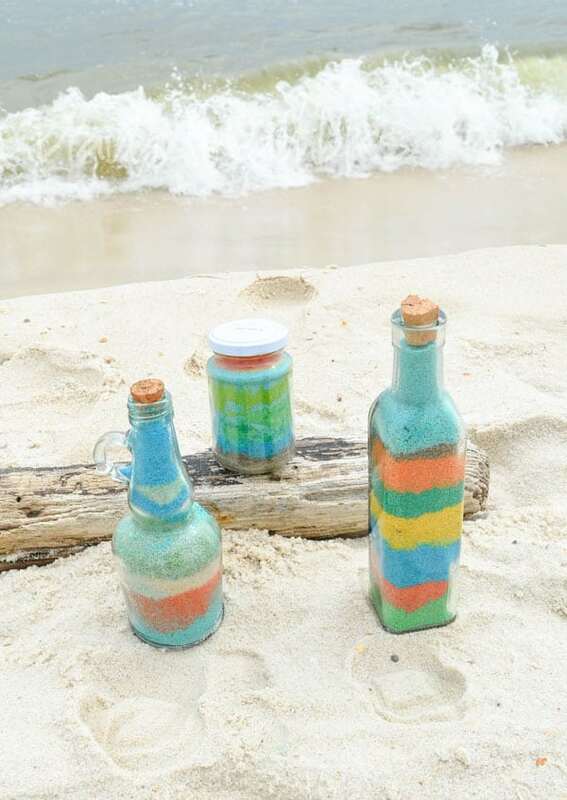 Have fun using the sand from the beach to create these sand art bottles. This craft utilizes the colored sand I showed you last week. Our spring break trip to the Gulf was awesome! We enjoyed many walks on the beach and playing in the sand. 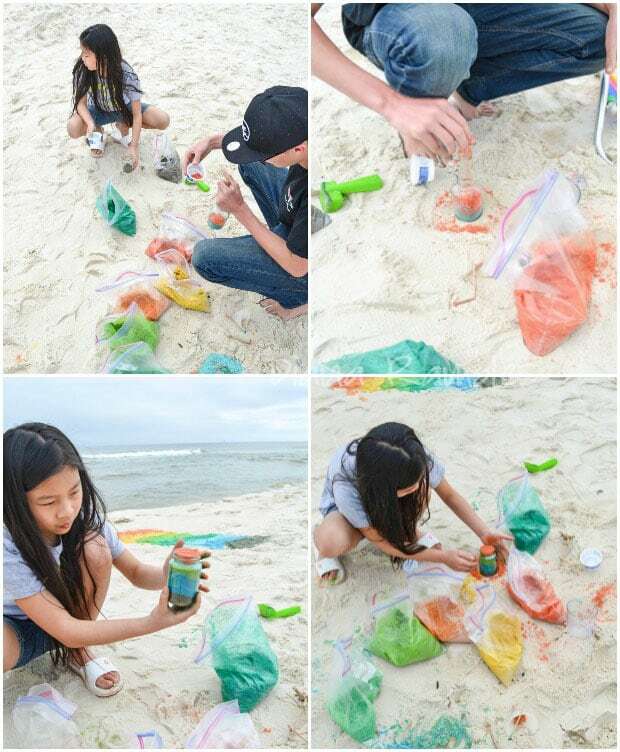 Our activities included coloring sand with food coloring and using it to make sand castles and colorful designs. 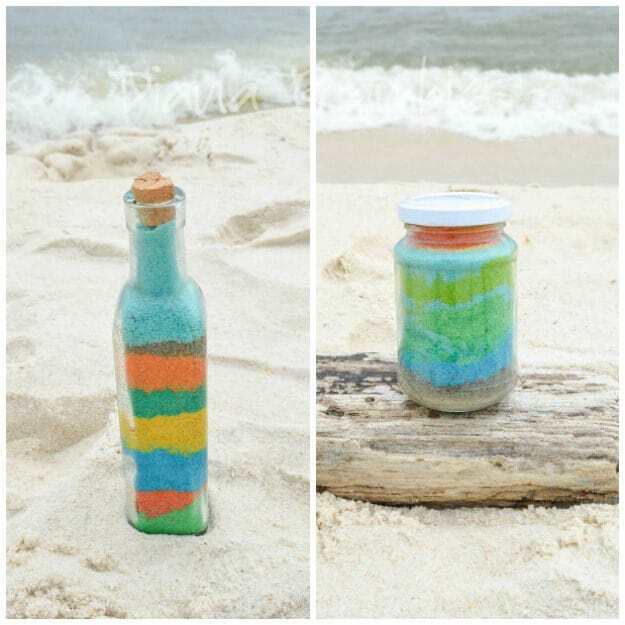 We also used the colored sand to make these sand art bottles. Color the sand in desired colors. You can find directions on how to do this here. Pour the sand into the bottle. You can use a funnel or spout. Our funnel was narrow, so we pushed the sand down with a wooden skewer. Gently tap down the bottle as you go. Do not shake the bottle. 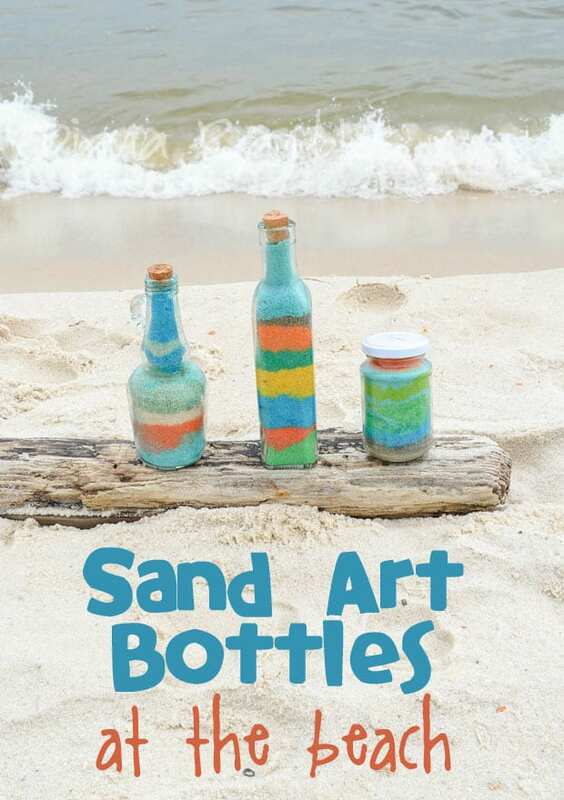 Continue to layer various colors of sand until you’ve reached the top of the bottle. Tap the bottle and add more sand if necessary. You want it to go all the way to the top of the bottle. The sand will settle, so make sure it’s really full! Place the cap on the bottle and display. I picked up my tall bottles at a dollar store. You can see from the supplies photo that the one was a vinegar bottle. I removed the spout that was on the top and added a cork from a wine bottle. The cork was too big, so I whittled it down with a knife. We are displaying it with the vinegar label in the back. I plan on hot gluing a shell we got at the beach to the top of the cork. Our short bottle is just a food jar we had on hand. It looks like it held maraschino cherries. I like how my son used some uncolored sand in his sand art bottle. It looks really good! I hope you’ve enjoyed this beach craft. 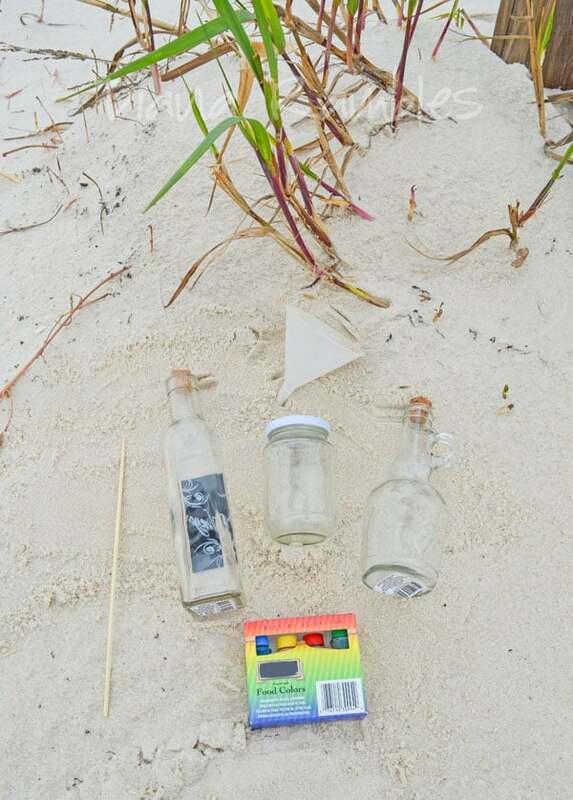 You should take supplies with you the next time you go to the beach. Any oceanside trips in the works for your family? Very retro!! I love these - I used to have a shelf full of them. The colors do have a retro feel to them! It was so much fun! This is so creative! WOW!! 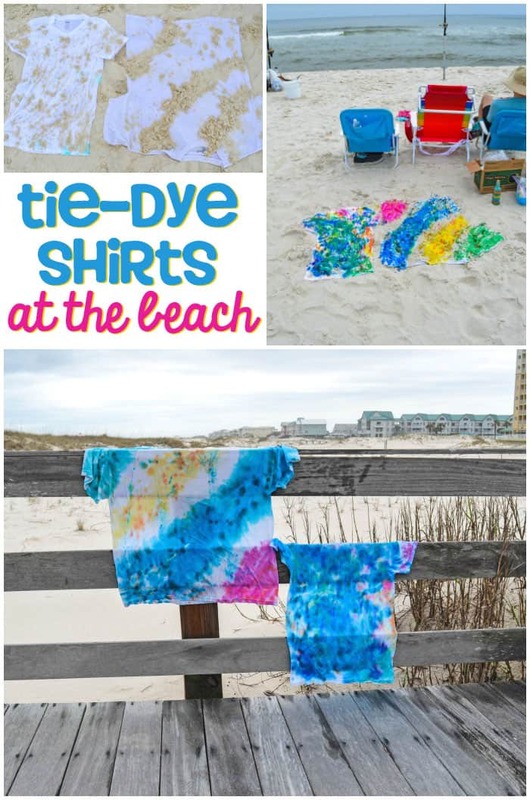 What a fun kids activity to do at the beach! Sounds like a fun party idea too! Pinned for future reference! We had one big craft day that was lots of fun. I should have turned it into a party!! We all need a beach!! I have always loved sand art, but hated the price of purchasing colored sand. I never knew you could dye it yourself! This is awesome! I can't wait to do this with my children when we go to the beach this summer. Those kits are pricey! Just DIY it!! This is soo cool! Bet my boys would have a blast doing this. Yes, kids of all ages. My teen loved making his!! Love this! It would be a great idea to do on vacation, a keep sake of a beach trip. This looks like so much fun! My boys would have a blast making these! Think of all the fun designs they can make! I can not believe how cute this is. I absolutely love it so much. I am definitely going to do this on my next beach trip. Love this idea too! Such great activities for the kids, so mom and dad can try to read a book! It was so much fun that mom & dad participated! What a fan activity for the beach! We don't have a beach nearby but I'll have to buy a little bag of sand because my kids will love this! Yes! I think it would work with sand from the hardware store! These came out really pretty - love how colorful they are. And they'll make wonderful souvenirs for you kids long after the beach days are over. Yes. My kids put them on their bookshelves to display. This is just the best idea! Get me to a beach so I can make these! Yes, to the beach to play and relax! This is so cool! Thanks for sharing at I'm Lovin It Link party.